All that’s gold glitters and shimmers (matte is in!) 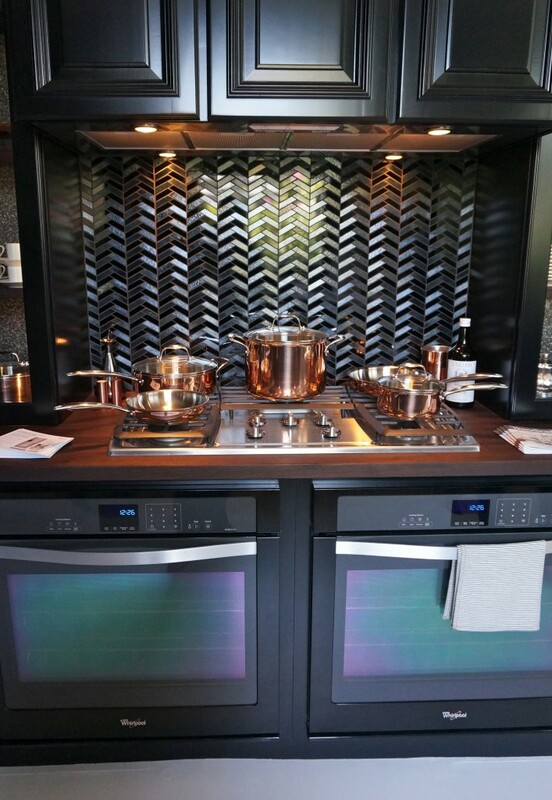 at this year’s San Francisco Decorator Showcase. 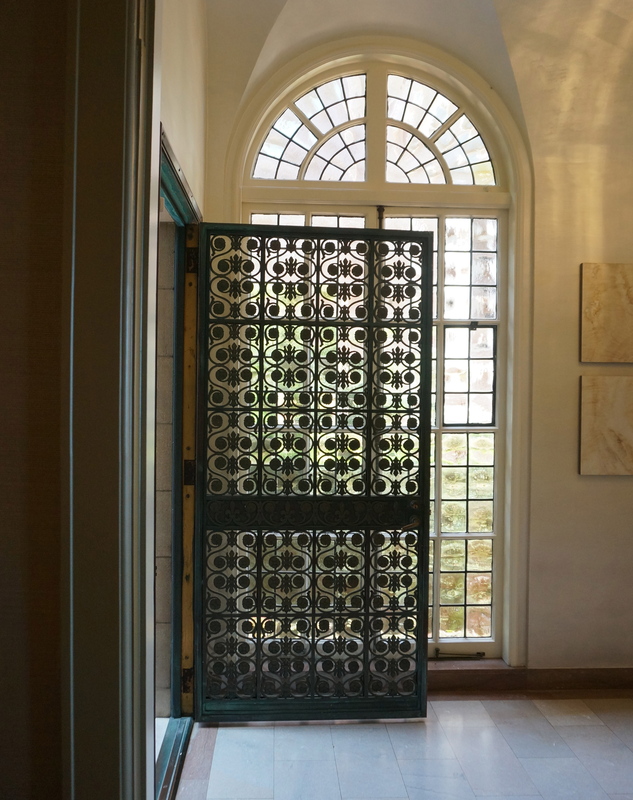 Held in a grand 1907 brick mansion in Presidio Heights, this showcase house offers the chance to see some of the best Bay Area designers showcasing their best work. The show runs through May 26–go to www.decoratorshowcase.org for tickets. 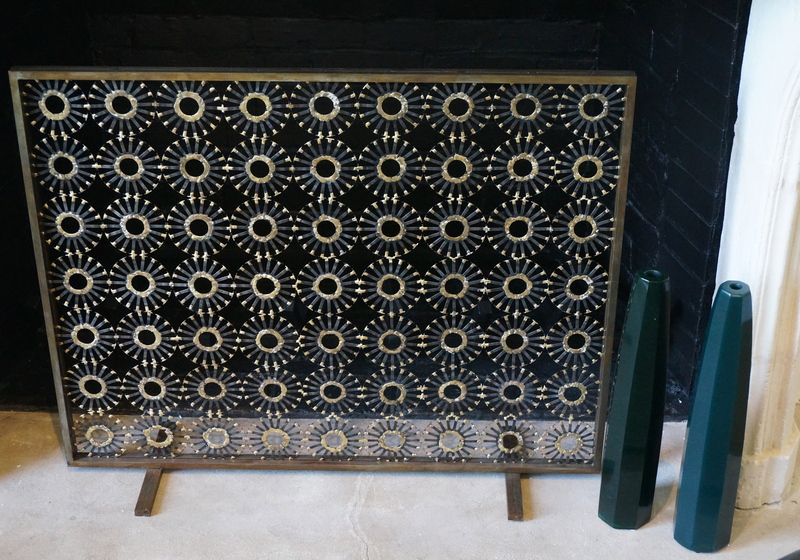 Here’s a sneak peek at some of the details that shone brightly–like the living room fireplace screen–at the Press Preview this week. 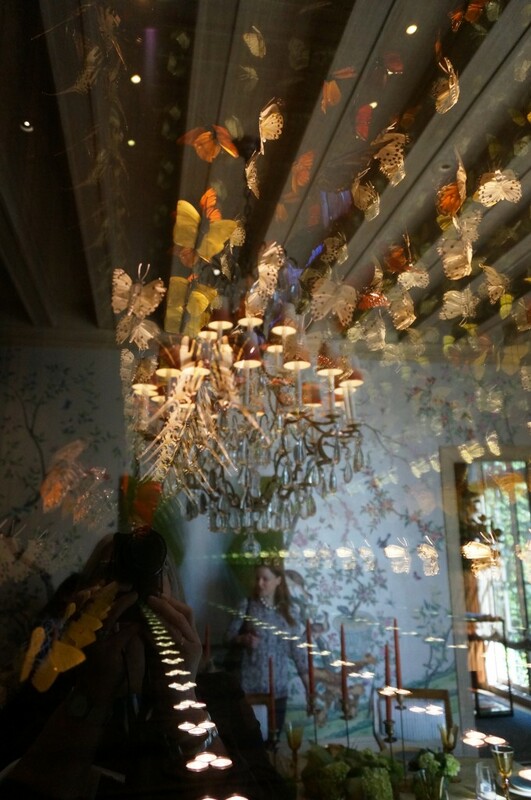 Modern art–like these butterflies suspended in an infinity mirror in SagreraBrazil’s dining room–dazzled. 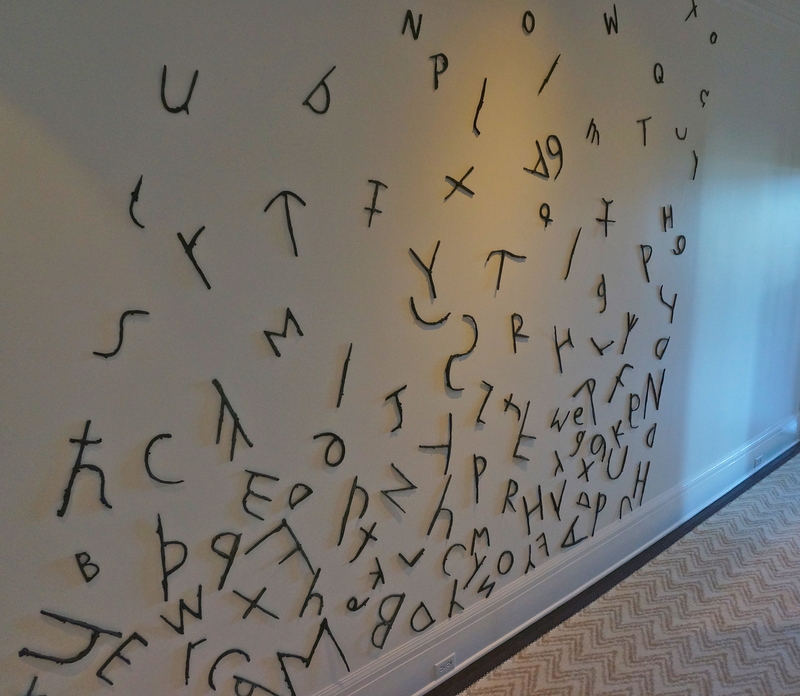 Or tumbled down a stairwell wall like these hand cast bronze letters and symbols in the hall outside the library. 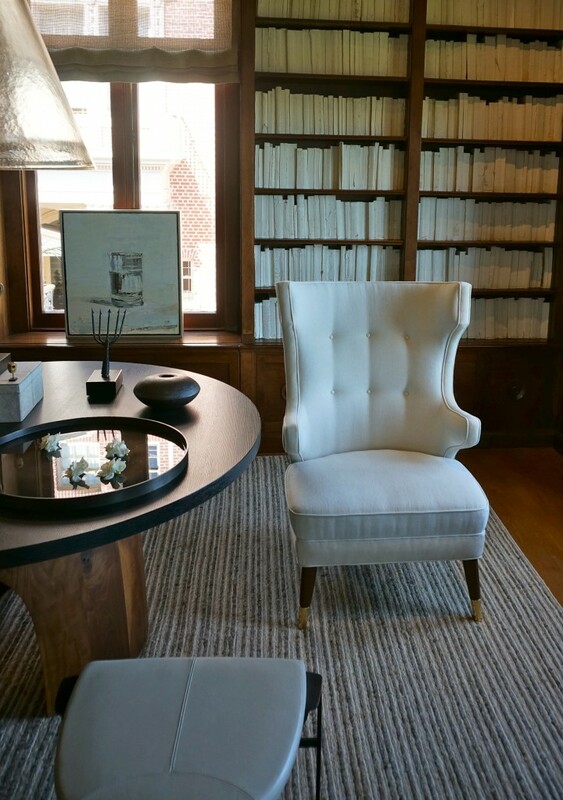 The white on white library by Geoffrey De Sousa featured hundreds (thousands?) of coverless books. 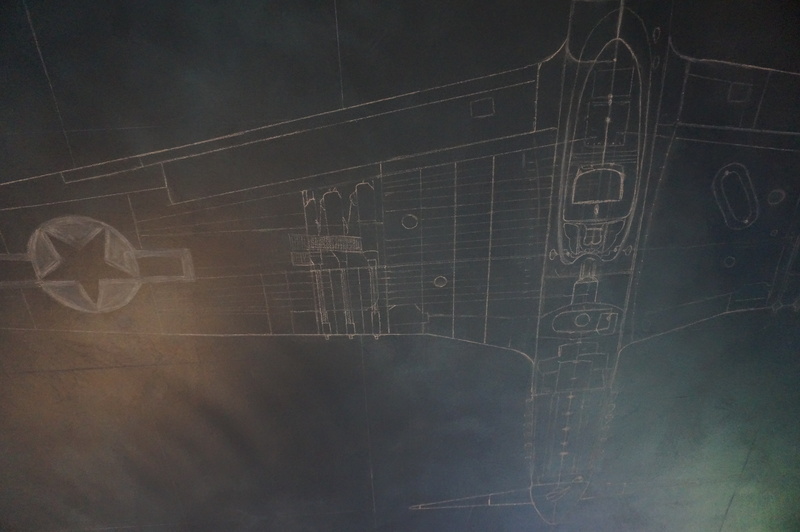 “The pages weren’t quite white enough so we hand-painted them,” says De Sousa. Both Miller and Antonio Martin chose to paint their floors bright white. 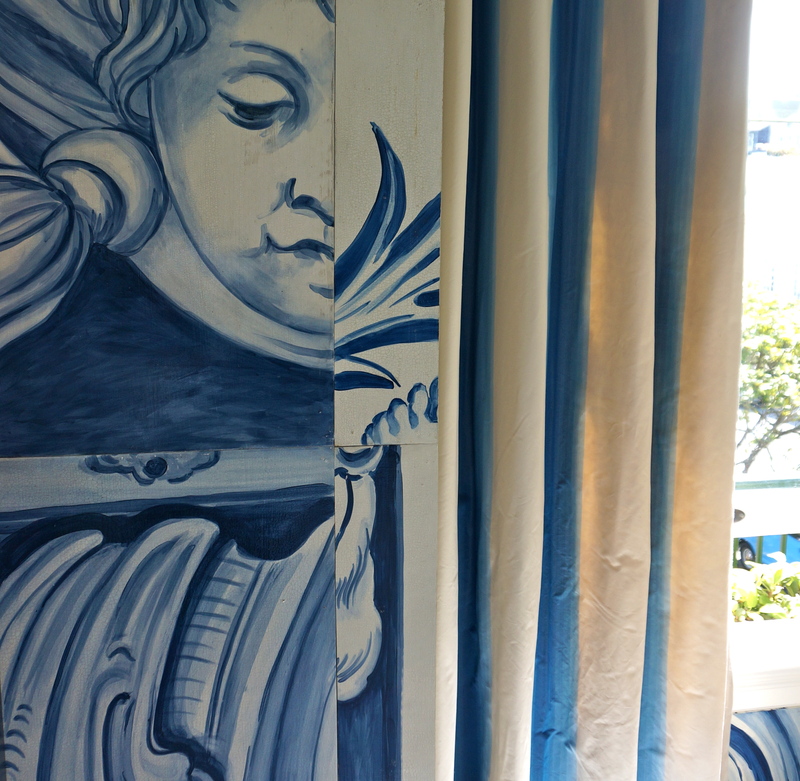 Here’s another shot of Martin’s joyful deconstructed Portugese tiles (painted by decorative painters Katherine Jacobus and Linda Horning.) 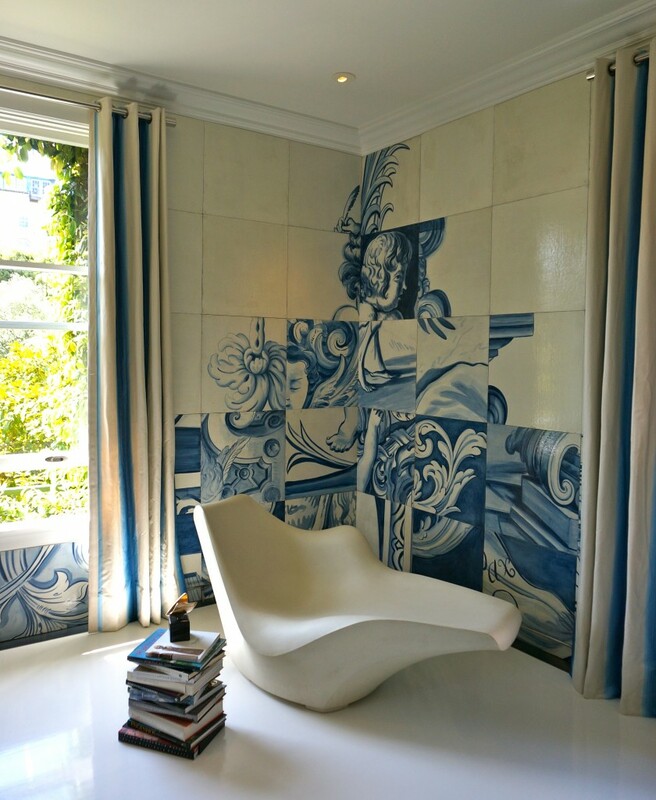 For more details about this showstopping room, go to Diane Dorran Saeks extensive feature at The Style Saloniste. No corner was left untouched including the chalkboard ceiling of this boy’s room by Shelley Cahan. 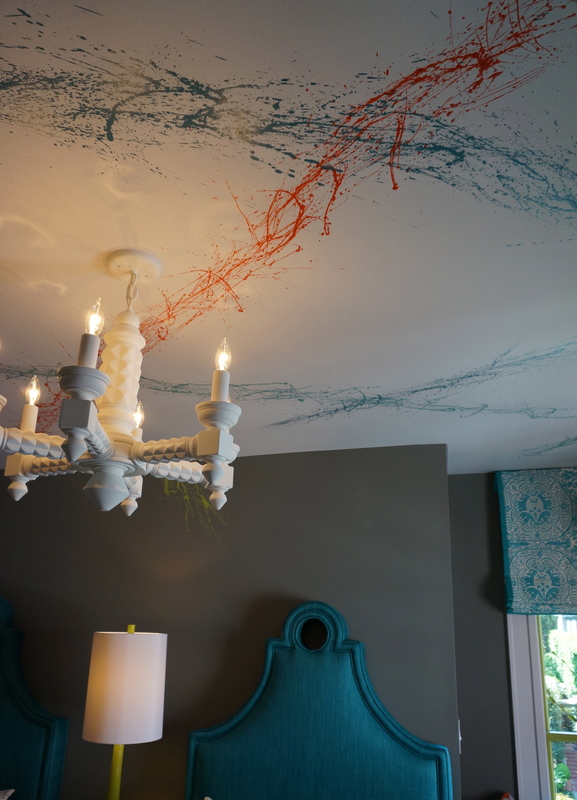 And the Jackson Pollock inspired ceiling in “Lily’s Pad” by Trineke Turk. 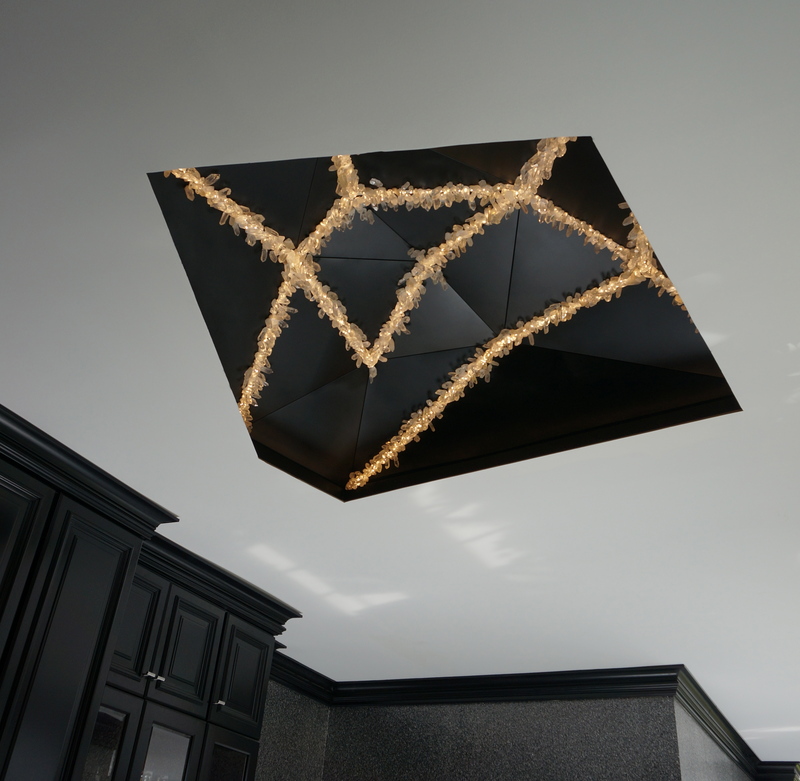 Miller inset this magnetized crystal light fixture in the kitchen’s ceiling. 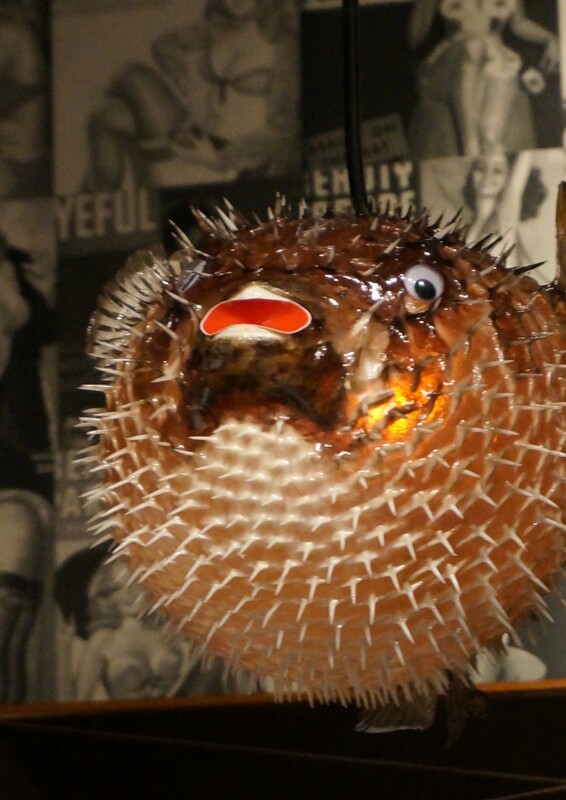 While Sunny K. Miller hung a real life puffer fish from the ceiling of her upper floor bar. 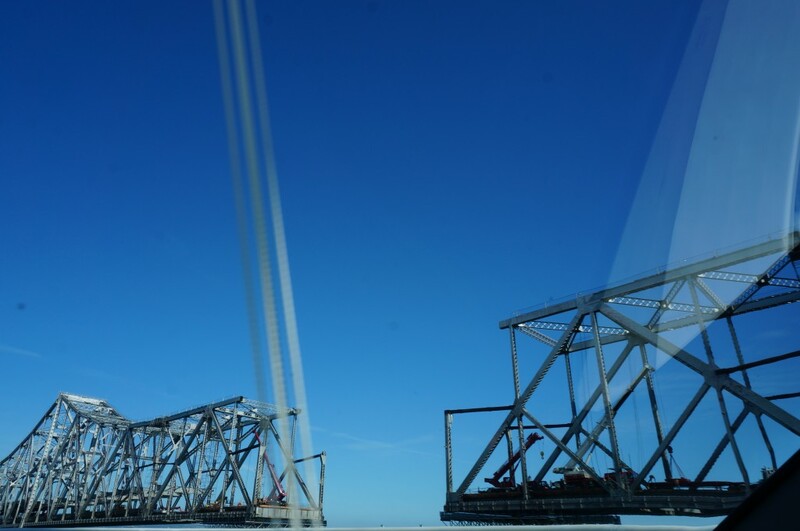 Which reminded me that one of the most memorable sights of the day was seeing the old Bay Bridge coming down on my way into the city. Look for more about the showcase next week in my Bay Area News Group story. This entry was posted in Shelter, Style and tagged accessories, art, Bay Area, furniture, interior design, lighting, showcase houses, Textiles. Bookmark the permalink. Post a comment or leave a trackback: Trackback URL. Fantastic photos? Would I be crazy to Jackson Pollock a ceiling? It looks so great. Not crazy. Fun! And probably messy. Love the living room fire screen! Anyone know who makes it and where I can find it? Natalia–my understanding is that it came from Liz O’Brien in New York. Beautiful, yes? Thanks for posting those photos. Yes, I saw the fire screen on the Liz O’Brien website. It’s made by Marie Suri. I love it!